Heal Your Puzzle » Blog Archive » What Does Your LIFE MAP look like for This Year? What Does Your LIFE MAP look like for This Year? I had a lovely image come to mind earlier this year of waking up in a beautiful bright sunlit landscape (2015). The sun was rising, it was around mid-morning, and I had this wonderful feeling of hope and peace, that everything was going to be ok, a new phase in my life beginning. Since this insight, I have found that my healing work with Goal Pictures has developed into working with far more complex Life Energy Maps. The diagram attempts to show this increasing complexity and also help you understand that the more stubborn life issues, whether physical or mental, will probably require work at the Life Map Level; a Simple Goal Focus will not be enough and self-development is necessary. So… What is a GOAL PICTURE? When you set yourself a Goal, whether personal or professional, emotional, mental or physical, you will be creating a focus in your Being to achieve something – deciding an A-to-B (1) [for more info]. 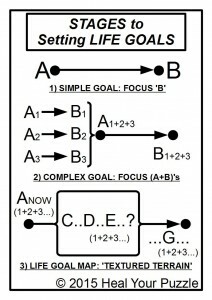 This process can be helped by using focusing techniques such as mental visualisations, meditation, and daily affirmations amongst many others to get a very clear mental image of your Goal ‘B’. However, a few years ago, I surprised myself when I was unable to draw a picture on paper of what I wanted to achieve, even when I used all of these techniques. My mental picture was very clear, even my emotional picture seemed clear, but to draw it on paper? I could not draw anything!? The only breakthrough I had was when I adapted my Kinesiology techniques to working with a Picture. I began to understand that when I physically drew on paper, an alignment and communication had to happen between my Conscious and Subconscious – a more interactive connection between my Inner World and my World in Reality… Try to draw your own Goal Picture for this year…easy?… If more difficult than you expect, it is probable that you are working with a more complex Goal Picture (2) – there are many A-to-B’s going on all at once in your Life and as many as possible will have to be brought into focus and aligned with each other for one clear Path and Goal Picture to form. The mechanism of physically drawing on paper facilitates this complex process.